If you want to entertain friends or business associates, launching a cocktail party is good. It is the right option. But to have an awesome cocktail party, you need to have planned for it. In this article, you will be shown how to plan a cocktail party on a budget. If you adhere to this guide, your entire guest list will recognize the full worth of your effort to arrange the latter. And your social clout will rise. What do you need to consider when planning a cocktail party? You can’t believe how simple it is to organize a cocktail party until you start preparing for it. Here are the things you need to consider when planning for a cocktail party. Book a Venue: Cocktail parties are not birthday parties. They are formal. House parties are not an option. A hotel or a restaurant will do. Invitees: Who will you invite? Make a guest list. If the party is meant for having fun with your office mates, business associates or to reunite your college long-seen friends, get a list of their names. It is needed when making a budget for the party. Send Invitations: Send the listed invitees invitations. Notify them -latest a week before- of the party. Everybody likes his schedule. Ensure that you will notify them promptly. Plan a Budget: After you’ve sent invitations and the right people have been notified be ready to prepare a proper budget. A budget that is good. Good in the sense that it will help do two things. One, a budget shows how much you will spend. Two, it tracks your spending as the preparation for the party goes on. Money is important when it comes to budgeting. Without money, no party can be launched. You’re about to read everything you need to calculate the amount of money to host a cocktail party. Where the GC is the Guest Cost and the NGC is the Non-Guest Cost. So, what do Guest Cost and Non-Guest Cost mean? Guest cost is the sum of money needed to cater to the cocktail party’s guests and it is usually determined by the number of invitees expected at the latter. While the non-guest cost is the money required to book the venue, rent chairs and tables (or party space), cater for entertainment, and pay for expenses that are not directly linked with the party’s attendees. RC = Cost for the rents. EC = Cost for entertainment, DJ, and related entertaining rants. Take for example the cost to cater for the food and drinks for each person at a cocktail party is $30 and 10 attendees are expected the party. But, the costs to rent a venue and hire a catering service are $100 and $150 respectively. The money to get a DJ is $200, and other expenses will be covered with $50. Using the steps illustrated in the example, you can calculate the amount of money you need to launch a cocktail party. 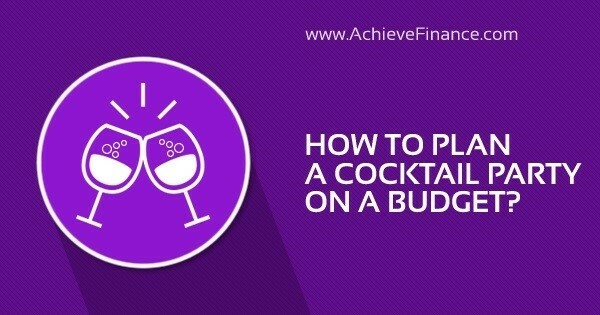 Your cocktail party budget must include the budget for food, decorations, entertainment and other necessary issues. You can get the money from your savings. If you are broke, you can take out a payday loan online. Taking out such a loan is the best option when it comes to seeking money to meet personal needs. Alcoholic wines are the labels for any cocktail party. Your guests can get drunk. Reserve plenty of ice for them. Mixers like orange juice, cola are also needed. Hire a bartender that will mix the wines for your guests. If you want to look professional at hosting a cocktail party, ensure your guests with some coffee at the end of the party, because drunken guests will find it helpful. Ensure you have everyone’s taxi company’s phone number. With such contacts, drunken guests can be handed over to a safe driver instead of driving under the effect of alcohol. No child should be allowed at a cocktail party. Every attendee should not bring their children to the party. Do not offer much food at a cocktail party. Nobody eats much at such a party. Just ensure wines are available. Even if food will be served, prepare a menu for seafood, finger foods etc. You can also spice up the party by offering sweets. This goes for every party event. Always prepare more than you expect. This article is helpful as it shows you how to plan a cocktail party, how to calculate the money to be budgeted and cocktail ideas that are trendy and fun!